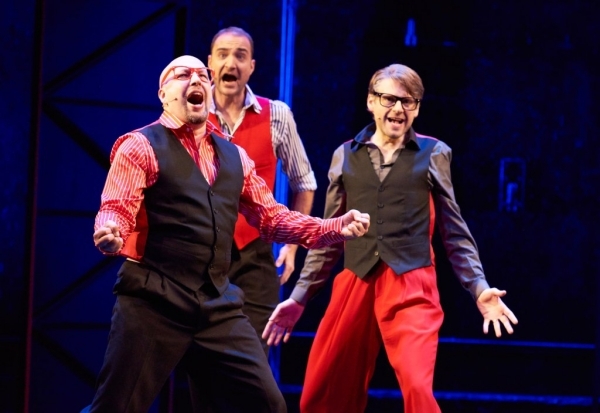 I’ve known the Showstoppers for many years, both the company and its producers (James Seabright and Suzanna Rosenthal), and over that time, I’ve seen the show many times – or rather I’ve seen many shows care of the Showstoppers exactly one time each. On one of those occasions, when the company was resident at the King’s Head, I was even a character in the show created. It was set in the offices of WhatsOnStage (obviously when I ran the company) before and during the annual awards ceremony, at which a murder had taken place. Visitors to the website had voted on a shortlist of potential scenarios and then members of our club, who attended the premiere of “WhatsOnStage.com: The Musical!”, decided everything else on the fly on the night. 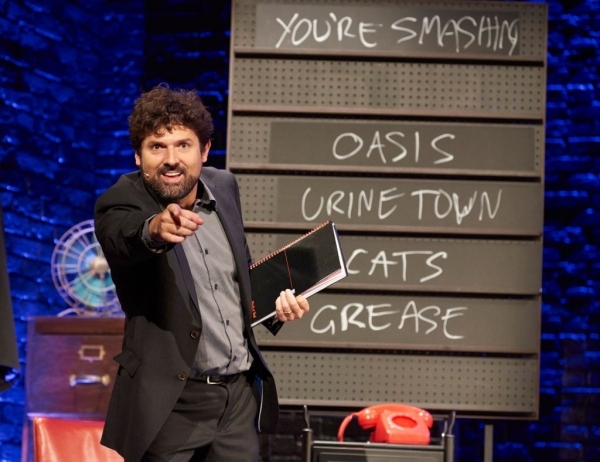 At this year’s Edinburgh Fringe, where the Showstoppers have long since achieved legendary status, my friends in the LoveBirds cast were positively addicted: I think between them, they must have gone at least a dozen times over the three weeks, and routinely recommended Showstopper! as their “Pick of the Fringe”. I was glad then to find that Showstopper co-founders Dylan Emery and Adam Meggido addressed their favourite “conspiracy theories” themselves in the programme. Which I now happily share with you. 1. The head mics are not just head mics, they contain earpieces. And backstage a team of writers are actually coming up with the material and telling the performers what to do. 2. The on-set clock is actually a feed, telling the group what to say and do. The on-set clock has a singular function and a very special purpose – it is used to tell the time. 3. They use plants in the audience to make sure they only get suggestions they have prepared in advance. The person who told us this said they ‘knew this for a fact’ because they knew someone who worked for the temping agency who employed the plants and even went so far as to confirm plants were paid £50 per suggestion. On hearing this, most of the Showstoppers thought about changing their jobs to become audience plants because they might make more money that way…. We don’t use plants of any kind. And of the short-list we get from the crowd, we get the audience to vote which one they want. 3. They have learned a few set musicals and just rotate them. We’ve performed over 600 musicals to date and some people have seen the show 20 or 30 times. We think they would have said something by now if we were repeating shows. 4. They have one set story and just swap in the occasional word to fit the setting. One reviewer genuinely believed that we only ever performed one musical – the story of a girl who falls in love with a boy in a band – and that we only performed that story every single time, swapping in the odd word to accommodate the setting. 5. Some bits are improvised but the songs and lyrics are worked out in advance. It is genuinely easier to make up a whole song from scratch than attempt to stick in something pre-written and adjust it to fit the current story. 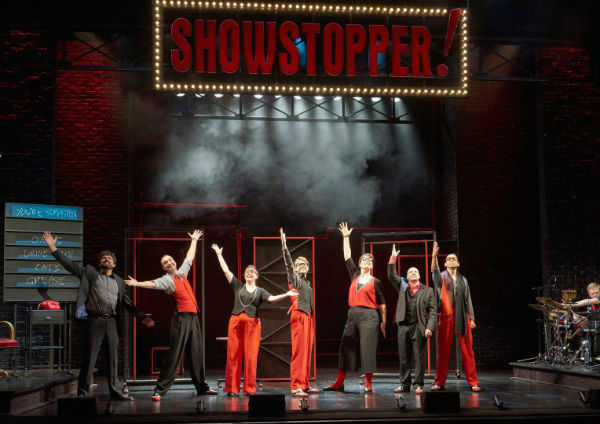 Since launching in January 2008, the Showstoppers have created more than 625 new musicals! These include Balls! (a love story with Roger Federer centre court at Wimbledon), Come Line With Me (set at the World Line-Dancing Championships in Texas), Emotional Baggage (an apt title for a tale of First Class romance at Heathrow Airport, with songs in the style of Sondheim and Abba), Sweeney Cod (in which an ambitious fish and chip shop owner falls victim to unrequited love, with a touch of Kander and Ebb alongside the pineapple fritters), and To Bleed Or Not To Bleed (a high-stakes opera of communist vampires, channelling Mel Brooks and featuring an undead chorus). You can trawl through the Showstopper archives here. Showstopper! 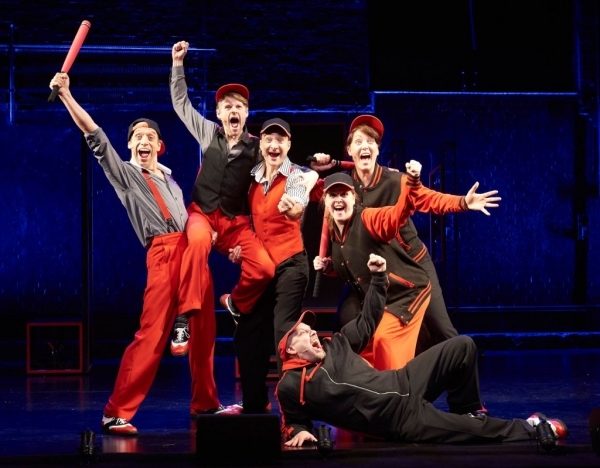 The Improvised Musical continues at the West End’s Apollo Theatre until 29 November 2015. They are amazing…What I want to do is see a live feed of what happens backstage as they silently create the next amazing characters and scenes which will arrive fully formed, and in glorious harmony, back on stage a moment later – fully costumed, and dancing in step too.